ODCA Venezuela: The Venezuelan 2008 election: update 13 - Zulia, Chavez personal failure? The Venezuelan 2008 election: update 13 - Zulia, Chavez personal failure? Considering that Chavez has been wanting to jail Manuel Rosales last week, I think it is time to review Zulia, the only certain good news for the opposition. Indeed, in spite of all the vitriol thrown by Chavez at Manuel Rosales and his likely successor, Pablo Perez, even pollsters that tend to favor Chavez are previewing victories by 20 points for the opposition. Note: this confirmed an earlier poll which was already establishing a favorable trend toward Rosales and Perez. If this turns out to be true it could by itself mean the very end of Chavez ambitions to force next year a reelection amendment. Henceforth Chavez involvement. Why does Chavez hates Rosales so much? That might be the question to understand what is going on over there. For this I can appeal directly to a post that just got published in Pajamas Media who asked me if I could explain such tantrums. I am just lifting from myself, 3 paragraphs over at Pajamas. And yet this [decree laws, inhabilitaciones, recentralization] is not stopping the rise of opposition candidates which is also starting to be fueled by the corruption of the regime exposed mercilessly in a Miami trial. Thus Chavez after having invented yet another assassination attempt on him has decided to jail notable opponents (the dozens of previously claimed assassination attempts have resulted so far in no blood spilled nor any trial or convicted figure or even a picture of the plotters in the press). Rosales has also another plus: he speaks like the people and he is very influential in the Andes region which is also escaping chavismo influence. He cannot run again for Zulia but he decided to go back to Maracaibo Town hall to retain a position of influence and remain in the news for future political plans. For some reason Chavez must have assumed that Rosales is the natural leader remaining for the opposition now that Mendoza and Lopez are out for several years. In his rage he has stopped measuring his words and yesterday he said that he was going to look into ways of putting him into jail. Note: this comes after he called Rosales “desgraciado” (without divine grace) which in religious Zulia is akin at cursing. Chavez is committing a major error here because if Rosales is indeed such a dangerous criminal, plotting against him to the point that he must cancel his visit to El Salvador for an important Ibero-American summit, how come Chavez did not have him arrested in the 8 years he has been governor? Has not Chavez controlled fully the intelligence apparatus since at least 2002, enough time one would presume to levy charges? We must thus interpret Chavez's anger to polls increasingly negative for his side and to him felling that he is losing control of the situation. He might not be wrong, but he is barking at the wrong dog: the fall of oil and an inflation reaching 40% will be his undoing much faster than any opposition politician can hope to be. Meanwhile his merciless attacks on Rosales, and others, only seem to strengthen them in the polls as they look like victims of abuse. Zulia is today the most populous state, a little bit like our California, or our Bolivia's Santa Cruz, a silly comparison that Chavez is fond of making these days as he threatens the state with military take over. He could not even dispatch promptly a military convoy to the Colombian border because it got stuck in traffic somewhere in Aragua, so we can wonder about his ability to militarize Zulia. The state was nothing much one hundred years ago as power in Venezuela resided then in the Andes and Caracas. The lower Zulia, humid and swampy, and Maracaibo unbearably hot lived because the commercial traffic of the Andes had to pass in front of Maracaibo. But oil came and all changed. Air Conditioned allowed the rise of our second biggest metropolitan area, filled fast by immigration and a healthy birth rate. Zulia developed two things: a rich an dynamic local culture that invades us every year at Christmas with its gaitas and the sense that the rest of Venezuela were leeches of Zulia's oil. That Chavez has abused this privilege of central government by also giving Zulia's riches to people as undeserving as Castro has not escaped the locals. Thus in spite of the misery that also exists in Zulia, chavismo has not prospered as much as elsewhere. True, the rise of a local politician of no particular charisma but of dogged will has helped. Zulianos in the early chavista years have been fond to cross their votes by electing Rosales to State and Chavez to Caracas. But this seems to be changing in an ominous way for Chavez. The first sign came with the red wave of 2004. All but two states fell in the hands of chavistadom. But Zulia not only resisted successfully, Rosales even improved his reelection score from 2000! Still, Chavez had won the Recall Election of 2004 there so there was noting much to worry, was it not? In 2006 Chavez won, but with the narrowest of margins in the country, and lost big in Maracaibo which was ruled by chavista mayor. This one, Giancarlo Di Martino, is now the candidate for governor. And then came the 2007 referendum where the margin of loss in Zulia was bigger than the national one! In Zulia the SI lost by 150 000 votes, nationwide it was a lower 130 000! The message was clear for Chavez as he took the threat personally. 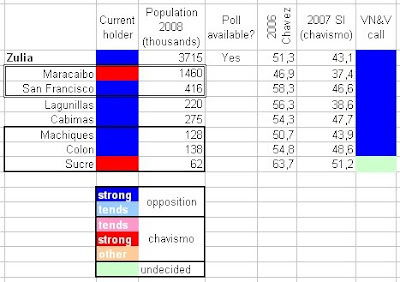 In the table above I have changed a little bit the format by putting the percentage of votes Chavez got in 2006 in different Zulia's districts and what those districts yielded in 2007. I think it is very, very clear. Zulia needs to go chavista for Chavez to get a chance to change the constitution in a legal way. But this is not going to be easy. We were surprised and disappointed across Venezuela when we saw that Rosales who could not run for reelection decided to go back as mayor of Maracaibo. True, Maracaibo is the second district of Venezuela but still, did this not reek of "I don't wanna go home!" ? Today we understand that Rosales had the right strategy. With Chavez's recent decree laws Rosales might have more money at his disposition as a mayor than as a governor. By controlling himself Maracaibo and having his protege as governor of Zulia, he transforms this one in a bastion. Chavez knows that very well and that is why he wants to put him in jail, except that the more he wants to, the larger the margin of victory for Rosales in Maracaibo looks like. The table above is divided in three. First the Maracaibo metro area. Di Martino holds Maracaibo town hall because eight yers ago he won helped in part by a portion of the opposition who saw him as a maverick of sorts within chavismo. His reelection in 2004 was rather a surprise though he had not been a bad mayor. But since 2004 he got himself closely associated with Chavez and even with some guerilla/para groups. His weak star started fading and no matter what Chavez does to help him he is not catching at the polls. In fact, a case can be made that any help form Chavez is more of a kiss of death for Di Martino. Today, the latest surveys put Rosales at 70% in Maracaibo and Perez close to 60% state wide. The second part are the oil working districts of Maracaibo. I chose Cabimas and Lagunillas as two districts hit very hard by the 2003 strike. Lagunillas has been lost for chavismo since then but Cabimas was still fighting grounds as it is more popular. But it looks like this time around Cabimas will finally break with Chavez. The rural areas of Zulia (which is also a major food producer in addition of being an oil producer, making Zulia a economically vibrant state) have suffered a lot form Chavez policies. Land redistribution battles have been frequent, guerillas trafficking a common sight and kidnapping a growing industry. Thus even though that there is a rural class that deserved help, it looks like chavismo will also lose strength where supposedly it should be the strongest. I had to scan all rural districts to find one that seemed safely chavista, Sucre. This small district, at the bottom of the Lake, warm, humid and poor did indeed go Chavez in the past. But the result of the 2007 election and a decreasing trend in other elections make me place it in the too close to call category. Thus we are maybe on the verge of a nearly clean sweep of the state for Rosales folks who should get the governor seat, 90% of town halls and perhaps even 2/3 of the legislature. Chavez indeed will have proven to be the best campaign manager of Rosales and he will have created a powerful opposition base for 2010 and 2012. Well, maybe not for the opposition, rather Zulia opposition because the particularity of Zulia does not apply elsewhere: unfortuantely for the rest of the opposition in Venezuela the Zulia example cannot be replicated, its "cultural" make up, to give it a name, is different enough form the rest of the country. Santa Cruz it is not, but neither it is Caracas. This post is dedicated to Juan Cristobal at Caracas Chronicles so he can remember the warmth of his home land as he gets ready for a cold winter.